I can’t wait to see this–hubby taped it for me–it all sounds so interesting! Thanks for the heads-up and the summary. Hey girl! I saw where you tweeted me so I figured I would just head over here and answer. Of course, this is a program on Henry and I found it incredibly informative. I wasn’t aware that he had malaria. My main problem was the oversimplification of Henry’s “Great Matter,” and I realize that comes from me being an Anne Boleyn fanatic. Obviously, they could only cram so much into a one-hour special on the medical maladies of Henry. Also, I don’t think there was enough of a focus on Henry’s mental health, and I think he did show a capacity to be cruel before his jousting accident in 1536. 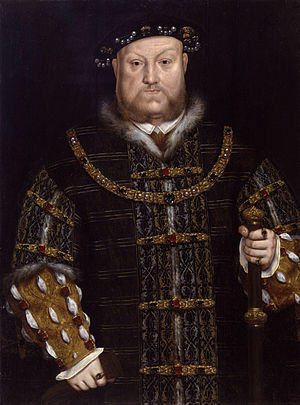 Yes, he had several health problems that would put Mr. Rogers in a bad mood, but at the end of the day my personal opinion is that Henry VIII was ultimately a mean guy. All in all, I really liked the show! I first saw it back in November or December, and was happy to see it again last night. But I could have gone for another hour for a more in-depth analysis. Great recap! I’ve taped the show (I didn’t have the heart to tape the Elizabeth show because I’ve heard it’s just a resurrection of rumors we’ve already heard) and I can’t wait to see it! Any chance on it coming out on DVD in the States? I would LOVE to see it!